Courtesy of Raices Taller 222 “Cloud World II,” etching by ADMO-Adrian Morris. The Day Before Raices Taller's annual monsoon show opened, a real chubasco drenched Tucson, showering the city with more rain than it had seen on one day in 118 years. Within minutes of the cloudburst, my neighborhood was submerged under two inches of water. The street turned into a river, and before long that river breached the curb. Around the corner a pickup truck floated north, only narrowly avoiding a collision with a recycling bin sailing steadily east. Normally, the gallery's monsoon show gets started when heat-weary Tucsonans are desperately longing for the rains. This year, by the time Aguas Sagradas ("Sacred Waters") opened, they were already rejoicing at the dark skies, the booming thunder, the rain slanting down toward the earth, the sudden drops in temperatures. An oil painting by Carolyn Sotelo captured the mood. Her expressionistic "Gotitas" ("Droplets") depicts a monsoon in full swing, offering a view through a car windshield of the flooded street ahead. Raindrops cluster on the windshield, distorting the buildings at roadside and the car ahead that's splashing through puddles. Above, the big stormy sky is softly painted in every shade of blue and gray. In "Blue House," Teri Pursch painted a benign flood like the one at my house. The rain is pounding down on her blue territorial and the street out front has turned into a glistening stream. Several artists in the show, which features dozens of locals, made portraits of drenched Tucson landmarks in the aftermath of a summer storm. In the ambitious acrylic "After the Monsoon," Eric Jabloner painted Mission San Xavier reflected in big puddles out front, its white towers shimmering in the water. Rosemary Downey celebrates "Saguaro National Monument East" in the wake of a fierce rainfall. Torrents of water are cascading down the steep, rocky trails, incongruously providing a waterfall to a national park that's all about the desert. Glory Tacheenie-Campoy goes abstract in her pale-blue monotype "Raining Cats and Dogs." Royal blue spatters hit the paper like raindrops smashing against asphalt, purple-pink spheres, outlined in red, pop up like bubbles, and wavy pink and purple lines mimic the ripples in a wave of water. Others embrace mythological. Richard Zelens, painter of bright, bold expressionist works, has painted a charming "Monsoon Serenade" that imagines a pair of modern-day rain gods. The two cheerful rainclouds, each with a human face, hover above desert mountains, blow storm winds into the sky. Their zigzag yellow lightning bolts shoot downward to the earth, and sheets of rain are turning the brown desert green. Of course, many of the artists, working in the shimmering heat before the storms broke, created pieces that radiate with the desperate longing for rain. In "Waiting for Rain" a print by respected Tucson artist Michael Cajero, we see the languid ennui of people too hot to move, almost too hot to breathe. Drawn in loose black lines, a mother and child are wilting on a city street. The woman is so inert she's nearly falling off a bench, and the child is almost collapsed on a sidewalk. You can almost feel the heat rising from the baked concrete and see it in the sweat of the mother's brow. 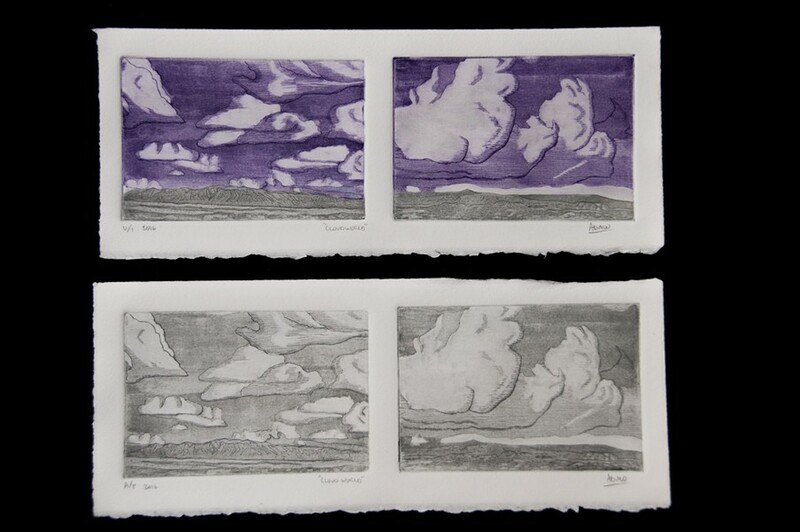 A young artist recently transplanted from New Mexico made "Cloud World II," etchings that remind me of the cloud games played by people scanning the skies for hints of storms. Going by the professional name ADMO, Adrian Morris grew up north of Gallup in the Navajo nation. Inspired both by his childhood landscape and his new home in Tucson, Morris etched in the outlines of New Mexico's Chuska Mountains as well as the contours of the Catalinas into a pair of prints, and set them side-by-side. On the left, Tucson's mountain chain rolls across the bottom of the paper, leaving lots of room for the sky show above. Plenty of fluffy clouds float prettily along this sky: a sight that would disappoint any experienced monsoon watcher. But the clouds over the Chuskas to the right are more promising. They're bigger and they're banding together; even better their undersides are growing dark, we hope, with rain. Artist Linda Bohlke took a 180-turn from the delights of the desert's summer spectacle. Taking the title of the show seriously, she gives her attention to humanity's sacred right to water. Her "Homage to Flint" is a mixed-media assemblage that's an angry lament for the poisoning of the water supply in an impoverished city in the richest country in the world. Part sculpture, part found-object display, "Homage" hangs on the wall. On the back panel is a map of water-rich Michigan, a state luxuriating in lakes and rivers. On a little shelf sit five small water bottles with rusted nails hanging down into discolored water. A photocopy transfer print reproduces a photograph of a two-year-old African-American boy who was poisoned by the lead in the city's water supply, a supply that was contaminated when—to save money—Flint's leaders switched to a cheaper new source. Fragments from a letter written by another child to the authorities are also posted. "So mad for kids," reads one scrap. "Happen in Flint," says another. And it could happen elsewhere. Arizona's sensuous rainy season is a reminder that the desert's waters are precious—and scarce. Water is the state's most valuable resource; our groundwater and watersheds are riches far greater than any profits to be made from a copper mine like Rosemont or from a massive housing development like Vigneto, in the parched landscape outside Benson. Joyous paintings such as George Welch's "Agua Flow" and Mary Reed's "Dream River," with their bountiful bouncing streams, bear witness to the holiness of the desert's waters, and a desert people's fierce need to husband our Aguas Sagradas.